My husband is a really picky pillow person (say that three times fast! :) so I am always on the search for the perfect pillow for him! My husband is finally satisfied with the new Proper Pillow! It provides optimal proper alignment when you’re on your back or on your side. The low-density comfort foam, as opposed to traditional high-density foam, allows your body to sink in properly while the pillow maintains adequate shape. 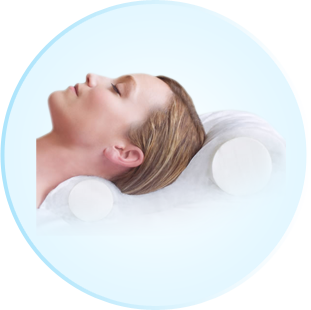 With dual positional capability, the Proper Pillow can be flipped 180 degrees to give your neck the proper amount of support. The Proper Pillow gives you the support you need with the comfort you deserve for a better night’s sleep. Studies demonstrate that improper pillows affect overall body structure which leads to adverse effects such as headaches, aches and pains, insomnia and sleep apnea. A bad night's sleep can even contribute toward a lower level of brain function throughout the day. The Proper Pillow gives you the support you need with the comfort you deserve for a better night's sleep. 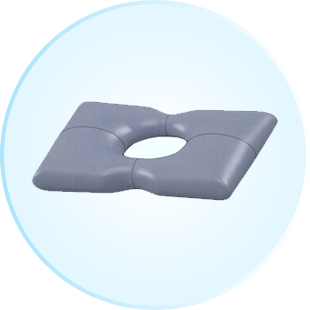 The Proper Pillow optimizes spinal and neck alignment. The patent pending inner orthotic pillow molds to fit each sleeper with ideal amount of support to properly align the neck, back and spine. No more waking up with a crick in the neck or constantly tossing and turning trying to find a comfortable position. What my husband loves most is that the Proper Pillow keeps cool! A restless night can often be attributed to your inability to cool down. 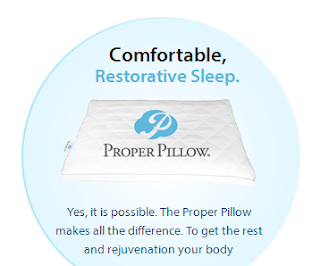 Proper Pillow's low-pile quilted outer shell and hollow polyester fiber sleeve gives the familiar feeling of your favorite pillow and allows airflow for a relaxing cooling effect. The inner orthotic utilizes breathable, low-density material. No more flipping the pillow to get to the "cool" side. The Proper Pillow provides optimal proper alignment when you're on your back or on your side. The low-density comfort foam, as opposed to traditional high-density foam, allows your body to sink in properly while the pillow maintains adequate shape. While many pillows must be purchased in a variety of sizes or support levels, the Proper Pillow automatically adjusts to you. With dual positional capability, the Proper Pillow can be flipped 180 degrees to give your neck the proper amount of support.